There are various stretching techniques, but three main methods have proven effective. Repetitive athletic movements can reduce your range of motion by tightening the muscles and tendons. There are two primary techniques for athletic stretching. Frédéric Delavier has captivated millions with Strength Training Anatomy. Now readers have access to Delavier’s exercise expertise and trademark illustrations once again with Delavier’s Stretching Anatomy. With full-color photos and illustrations, this guide depicts over 130 exercises to increase flexibility, tone muscles, and reduce injury. Get an inside view of the muscles in action during every stretch you perform! Delavier’s Stretching Anatomy is your guide for increasing flexibility, improving range of motion, toning muscles, and relieving pain and discomfort. 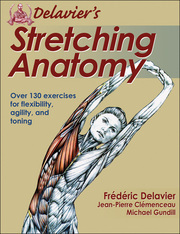 The very best stretches for shoulders, chest, arms, torso, back, hips, and legs are all here, and all in the stunning detail that only Frédéric Delavier can provide. With over 550 full-color photos and illustrations, you’ll go inside more than 130 exercises to see how muscles interact with surrounding joints and skeletal structures and learn how variations, progressions, and sequencing can affect muscle recruitment, the underlying structures, and ultimately the results. Delavier’s Stretching Anatomy includes 13 proven programs for increasing muscle tone, releasing tension and stress, and optimizing training and performance in 13 sports, including running, cycling, basketball, soccer, golf, and track and field. The former editor in chief of PowerMag in France, author and illustrator Frédéric Delavier is a journalist for Le Monde du Muscle and a contributor to Men’s Health Germany and several other strength publications. His previous publications, Strength Training Anatomy and Women’s Strength Training Anatomy, have sold more than 2 million copies. The former editor in chief of the French magazine PowerMag, Delavier is currently a journalist for the French magazine Le Monde du Muscle and a contributor to several other muscle publications, including Men's Health Germany. He is the author of the best-selling Strength Training Anatomy, Women’s Strength Training Anatomy, The Strength Training Anatomy Workout, and Delavier's Core Training Anatomy. Jean-Pierre Clémenceau is a fitness coach to the stars and has trained numerous French celebrities using an approach based on positioning and breathing. Clémenceau has worked with legendary actresses including an Academy Award winner Juliette Binoche (Chocolat, The English Patient, Three Colors: Blue, The Unbearable Lightness of Being), Charlotte Gainsbourg (Melancholia, The Science of Sleep, I'm Not There, 21 Grams, Elektra recording artist), Emmanuelle Béart (Mission: Impossible, Don Juan, Manon of the Spring), and Jane Birkin (Blow-Up, recording artist, muse to musicians John Barry & Serge Gainsbourg, and namesake for the Hermès Birkin bag). He is the author of over 15 health and fitness books as well as numerous exercise DVDs. He has a background in yoga, shiatsu, and reiki. Michael Gundill has written 13 books on strength training, sport nutrition, and health including co-authoring The Strength Training Anatomy Workout. His books have been translated into multiple languages, and he has written over 500 articles for bodybuilding and fitness magazines worldwide, including Iron Man and Dirty Dieting. In 1998 he won the Article of the Year Award at the Fourth Academy of Bodybuilding Fitness & Sports Awards in California. Gundill started weightlifting in 1983 in order to improve his rowing performance. Most of his training years were spent completing specific lifting programs in his home. As he gained muscle and refined his program, he began to learn more about physiology, anatomy, and biomechanics and started studying those subjects in medical journals. Since 1995 he has been writing about his discoveries in various bodybuilding and fitness magazines all over the world.